Studio sessions are becoming my favorite, because of the flexibility and accessibility we have. During studio sessions, there isn't a time crunch because we aren't chasing the sun. We can schedule them earlier or later in the day, easier to work around schedules. With all that being said, I also feel a little more creative freedom in the studio. 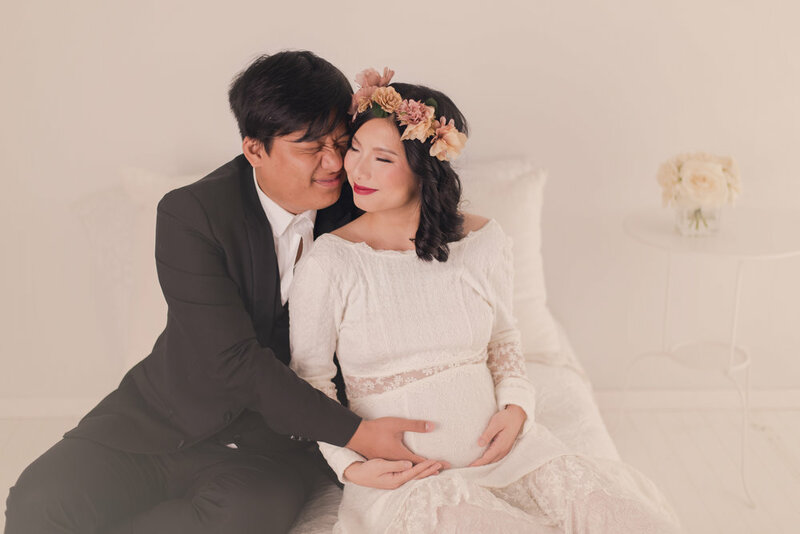 This mom came to us with very specific requests for her custom maternity session. She dreamed of classic and elegant. She liked the look of old time hollywood, and I think we pulled it off nicely. She was extremely pleased with these images, as was I.
I would like to add, I love this couple so much. They were such goofballs and kept me laughing the whole session. I almost peed my pants a few times. ;) You only have to spent a minute or two with them to see the light and fun nature of their personalities.